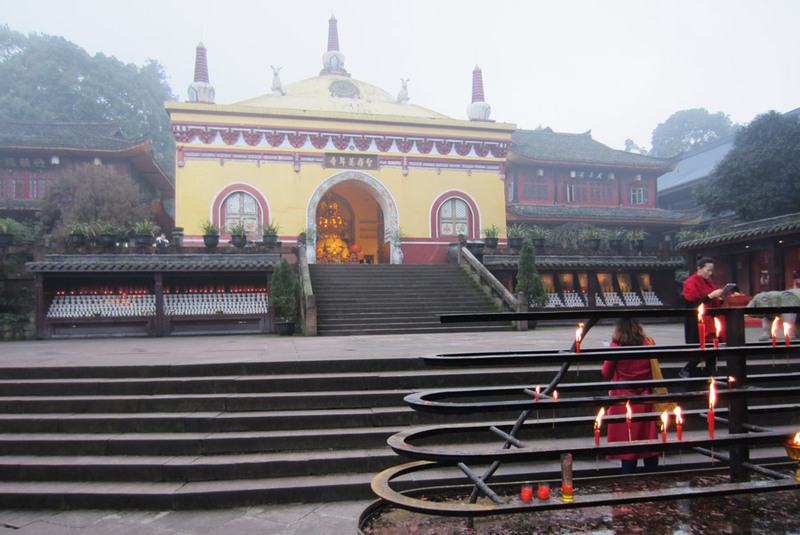 Emei Mountain: Why is it so Sacred? As far as sacred mountains go in China, Emei is one of the most important. In fact, it’s the largest of the 4 Sacred Mountains of Buddhism in China. Emei means high and lofty. At 3099 meters, it’s an appropriate name. You’ll sometimes see the name Emeishan or Emei Shan (峨眉山) – shan simply means mountain. 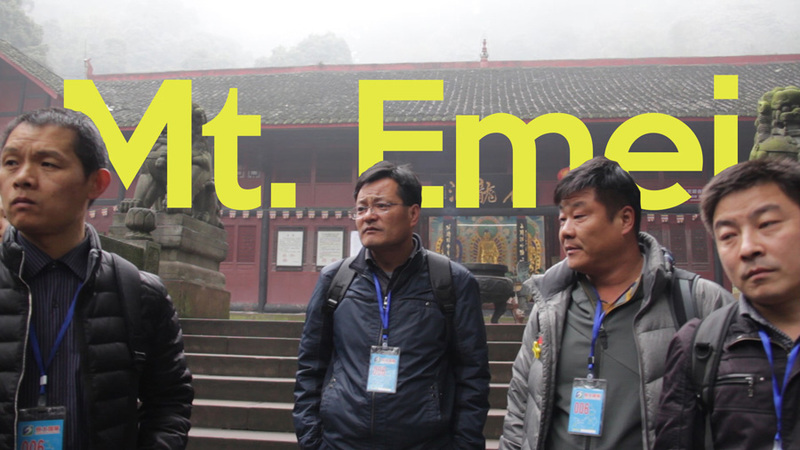 The proper pronunciation of Emei is something like uh-may, as in uh-mazing! The mountain combines nature and culture with its many temples and monasteries that dot the mountain-side. Even if you aren’t a Buddhist, you’ll enjoy their mystical beauty. Most people will be coming from Chengdu, which makes things easy. The high-speed train only takes about an hour and costs around 65 RMB ($9.50). Most of the trains leave from Chengdu East Station, but there are also options from the more convenient (and less busy) South Railway Station. There are quite a few daily trains, but it might be worth it to buy your ticket ahead of time by going to the station or to a travel agent in China. If you aren’t traveling on a weekend, holiday, or after 5:00 PM, you can probably just arrive at the station and buy a ticket. Note: If you prefer to leave from South Station, check the trains that say they are leaving from Chengdu East, some of them will stop at the Southern Station, but they won’t show up as options when you search for the Southern Station. You can also take the bus to Emei, but the cost difference (only 10 RMB cheaper) is hardly worth the extra 2 hours of travel. The buses leave from the tourist bus station whenever they’re full between the hours of 7:20AM and 7:20PM, so if you’ve missed out on the train the bus is a great last minute option. The bus goes to the town’s main bus station, which isn’t the bus station that goes up the mountain, so you’ll need to take a taxi to Baoguo village (报国). Coming from Kunming, you can take an overnight slow train that takes about 15 hours and costs 350 RMB ($50) for a soft sleeper and 230 RMB ($33.45) for a hard sleeper. All the trains leave around 6-7PM. When you arrive at the train station, you can walk to the Baoguo village (the tourist area) in about 30 minutes. A taxi will cost about 15 RMB and the #8 bus (catch it across the road from the train station) is 2 RMB. The last stop is Baoguo, a mere 500 meters from the bus station that will take you up the mountain. Hotels are all over the place. You can stay in Emeishan city, specifically the area called Baoguo village, where food options are greater and there’s an overall higher level of comfortness. Or, stay on the mountain and be closer to the actual reason you’re there, but put up with very basic rooms that are quite frigid. Before you pick out an accommodation, you need to know what you want to do on the mountain and how much time you can spend on it. If you want to see the sunrise, you should stay on the mountain. If you just want to spend a day hiking and checking out a few temples before heading back into town for a nice dinner, then the city will work well. Almost every monastery will rent out a room for the night. Back in the day, the monasteries were free to weary travelers. Then they started charging a modest fee. With more and more tourists (and not just people on pilgrimages) wanting to stay, the prices rose. Nowadays, very basic rooms go for around 150 RMB – not a lot, but they may not have electricity, and the shared bathrooms are likely pretty rough. That being said, if you’re trying to hike the entire mountain they are a perfect place to crash your weary body and just ‘peace out’ for the night. There are also guesthouses on the mountain that offer better rooms, but not as good as you’ll get at the bottom of the mountain. The Jinchuan Hotel is located around the Huazang Temple, a short ways from the amazing sunrise. Jinding Hotel is a good option if you want to stay within a 15 minute walk to the top. The rooms aren’t amazing, but the location is. There are far more options in the city. A popular one is the Mount Emei Teddy Bear Hotel, but when we stayed there they pissed me off by giving us a room with two double beds after we booked a King room. They were also very pushy when it came to eating at their restaurant. They followed us out the door trying to convince us to eat at their place. We actually had breakfast there one morning and it was terrible. I’m sure their Chinese food is decent, but it was also pricier than the restaurants around the corner. Mount Emei Happy Hotel is likely cheaper and gets better reviews. Mount Emei Shanshen Hotel is another good option. If you want a place that doesn’t see too many western travelers you’ll have to book through a Chinese site like CTrips. Meng Ba La Hotel gets great reviews, has some fun theme rooms, and is priced quite well. All these are just a short walk to the buses that go up the mountain. The majority of restaurants in Baoguo village serve delicious Sichuan food. They are reasonably priced and the food is amazing. There are also a bunch of restaurants that serve meat on sticks that has been soaked in a chili oil broth. Some places will simply put a bowl of food on your table and then you pay for what you eat. Other restaurants let you pick out what you want and then they’ll cook it up for you and serve it soaking in the broth. There is a pedestrian food area past the bus station going towards the mountain. The many restaurants offer delicious looking food, but walking through it was more annoying than appetizing, with people constantly trying to convince you to eat at their place. Smoked BBQ ribs. Follow me on Instagram for more! My favorite meal in Emeishan was found just outside of this area on the street just before you reach the pedestrian food area. Right by the large gate, there is a place that barbecues meat and veg on a stick. The busy restaurant was fun and the food was great. Not being able to speak Chinese, we just picked out the sticks we wanted and got the waitress to record it all down. Be sure to try the ribs and the sausage. You can also sample some of their sweet jiu. Honestly, I don’t know what this stuff was made from but after watching people go back for more and more, we decided to try a glass. It was about 15% alcohol and was a bit like cough syrup. Some street food that’s worth seeking out is a tofu soup called tofu brain (豆腐脑). Don’t worry, there’s not any actual brain in it. Instead it’s filled with spices, beef, and of course chunks of tofu. Also, be sure to try the smoked ribs that you can get outside of the restaurants along the main road. A couple ribs and a baozi (steamed bun filled with meat) are actually a pretty decent breakfast. On the mountain there are lots of restaurants – some just stalls with a few tables, some fancier. All will be more money than the ones at the bottom of the mountain though. We had one meal on the mountain, a bowl of freshly made wantons in a nice hot pork broth. The cost was 20 RMB. You should also watch out for tasty snacks along the way. Again, they’ll cost a bit more, but they’re so cheap anyways you’ll hardly notice. You can get fresh fruit, deep fried breads, nuts, and much more. The monasteries also serve vegetarian food during the 3 meals of the day. They food isn’t anything spectacular, but it will fill you up and it’s cheap. Of course, there is plenty of hiking/stair climbing in the park, but if walking up flights of stairs doesn’t sound like fun, you can also take the bus up the mountain. Takes 2 hours and the bus ride is known for making people vomit. From there you can take the cable car up to the golden summit, or hike to it in about 2 hours. Go halfway up the mountain. Takes 30 minutes. You can get off at Wannain or Wuxiangang. From Wannain, you can hike up to the temple (about an hour), or take a cable car to it. From Wuxiangang, you can hike to Qingyin Pavilion then over to Wannian temple (about 3 hours), where you can take a cable car or hike downhill to the bus station. Travel Tip: While you explore thrilling adventures don`t forget to catch up with your pending work by accessing your online private work space remotely from anywhere on any device (PC/Mac/android/iOS) with cloud hosted citrix vdi powered with 24*7 excellent tech-support from www.Apps4Rent.com. The hiking trail can hardly be called a trail. It’s paved the whole way and you’ll mostly be walking up stairs. This means hiking boots aren’t necessary – a lighter running shoe is better. You will also see people in the parking lot trying to sell you homemade crampons. I bought a pair – mainly because they were ghetto-looking and made me giggle – but I didn’t need them at all. Perhaps deeper into winter (we were there in December) the crampons would be useful. A better purchase would be one of the bamboo sticks that can be used to take some stress off your knees and to fight off monkeys. That’s right, the Tibetan macaques can get a bit crazy. They’ve been known to jump on tourist’s backs and will undoubtedly try and steal any food that you’re carrying. 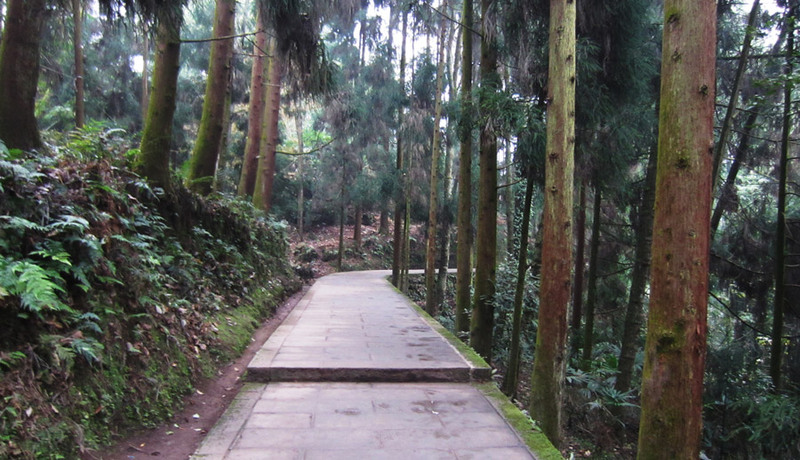 The ‘hiking trail’ on Mount Emei. If you are planning to hike the whole thing, make sure you take your time and stop whenever you feel like quitting for the day. The 70 or so monasteries are spread out enough that you should be able to find a bed any point of the hike. You shouldn’t have to worry much about water and food. There are plenty of places along the way that sell slightly overpriced sustenance. While it’s possible to hike the entire thing in a day, you’re going to want to take 2, or even 3 days to enjoy the temples. Get more information about hiking the entire mountain here: So many stairs! We hiked from Wuxiangang Bus Station up to Qingyin Pavillion then over to Wannian Temple and down to Wannian Bus Station. I think it was about 5.5 kilometers in total and it took us around 5 hours. This included stops for lunch and at various monasteries. Originally, we had planned to then take the bus to the top, but we felt that we didn’t have enough time and decided to head back down the mountain and visit Baoguo Temple instead. It would have been nice to reach the top, but the fog was thick that day and I doubt we would have seen much. With 76 monasteries on the mountain, there are plenty of opportunities to get spiritual. While there are a lot of people there for exercise and fresh mountain air, most of the tourists are climbing stairs because of the mountain’s religious significance. Some information on the always-accurate internet says that Emei was the location of the first Buddhist temple in China. Other websites fail to mention this seemingly important fact, and traditionally the White Horse Temple in Luoyang is thought to be the first. At any rate, Emeishan has been important to Buddhism in China for a very very long time (like the first century). The mountain is considered a bodhimanda (a place where enlightenment is present) for the bodhisattva (a being that has reached enlightenment because he wanted to help other living beings) named Samantabhadra. Samantabhadra is associated with practice and meditation. While becoming a bodhisattva he made ten vows that have become popular for Buddhists to use in their chants. At Wannian temple you’ll find a giant statue of Samantabhadra on a white elephant. The white elephant consistently shows up with images of Samanta. It’s thought to be the same elephant that Buddha’s mother dreamed of before waking up and discovering that she was pregnant with Buddha. At the top of the mountain, the Golden Summit, you’ll be met with a very impressive multi-faced golden statue of Samantabhadra on an elephant. In Chinese, Samantabhadra is known as Pǔxián. There are many costs – entrance fees, bus tickets, etc – that add up when visiting the mountain. Here are the majority of them. 185 RMB (from Dec 15 to Jan 14 it’s only 90 RMB) – ticket is valid for 2 days. You can also get one way tickets for half the price. While you’re in one of the administrative divisions of Leshan, you might as well head over to Leshan city proper, where you can sample some specialty dishes and visit the largest stone Buddha in the world. From the Baoguo bus station, take a bus for an hour for only 11 RMB. They leave every half-hour from 7:30AM-5:30PM. From the Emei Center Bus Station you can get to Kangding (10:50AM – 20 RMB), the gateway to Tibet. For more information about the city check out my guide to seeing Tibet in Sichuan province. The train station offers rides to Chengdu, Kunming, Xi’an, Xichang, Panzhihua, and even Beijing. Check this site for the schedules. If you’re heading to Chengdu, be sure to check out the videos and guides that I’ve put together that cover the various attractions in the city.